US corporate bonds extended their bull-market run to a sixth consecutive month in April, with highyielding issues leading the advance. Corporate spreads tightened by 30 basis points versus US Treasury securities during the month, according to Wei Wang, analyst at Citigroup Global Markets in New York. “The market got a strong lift from the speedy resolution of the war in Iraq and better-than-expected firstquarter earnings,” he says. High-yielding paper continued to enjoy the strongest bids, which again favored lower-rated sectors,Wang says. 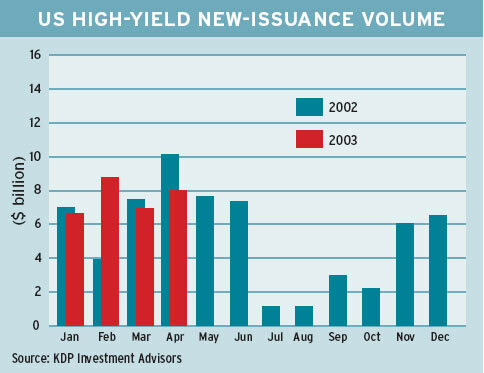 US high-yield newissuance volume rose to $8 billion in April from $6.9 billion a month earlier, according to Vermont-based KDP Investment Advisors. Toledo, Ohio-based Owens-Brockway Glass Container, an indirect subsidiary of Owens-Illinois, was the largest issuer of high-yield securities in April.The company sold $450 million principal amount of 7.75% senior secured notes due 2011, and $450 million of 8.25% senior notes due 2013, in a private offering. Owens-Brockway said the net proceeds from the note offerings would be used to purchase $300 million of 7.85% senior notes due 2004, and to permanently reduce the revolving loan portion of its secured credit agreement, which matures on March 31,2004. Owens-Brockway owns all of Owens-Illinois’ worldwide glass container operations in 19 countries plus Puerto Rico. Houston-based Equistar Chemicals, a major producer of ethylene, propylene and polyethylene, sold $450 million of 10.625% senior notes at par in a private placement. Equistar said it would use the proceeds to prepay $300 million of 8.5% bonds due in 2004 and approximately $122 million of the $296 million of outstanding term loans under the company’s credit facility. Lyondell Chemical owns 70.5% of the Equistar partnership, while Millennium Chemicals owns 29.5%. 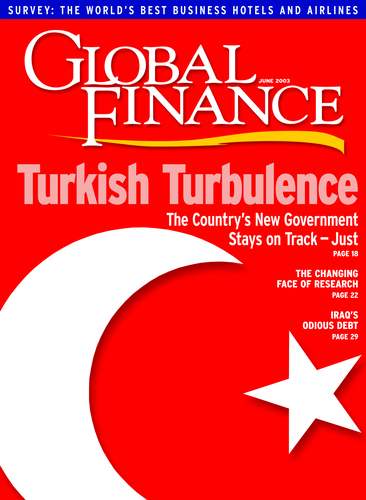 Deutsche Börse, the Frankfurt-based exchange, launched an inaugural benchmark bond in the corporate Eurobond market on May 9, 2003. The issue totaled 500 million euros, or about $580 million. It will mature on May 23, 2008, and carries a coupon of 3.375%. Priced at 99.751, the Eurobond issue was three times oversubscribed and was distributed among 200 institutional investors. Approximately 60% of the issue went to investors in the UK, Switzerland, France and Italy.The remaining 40% of the bonds were placed with German investors. The exchange said it would use the proceeds to replace a short-term financing it incurred to acquire Clearstream International, the global clearing and settlement organization, in July 2002.